I read a sensational headline the other day. Sensational not because it was a great headline. It was sensational because it reported something that wasn’t true … yet. 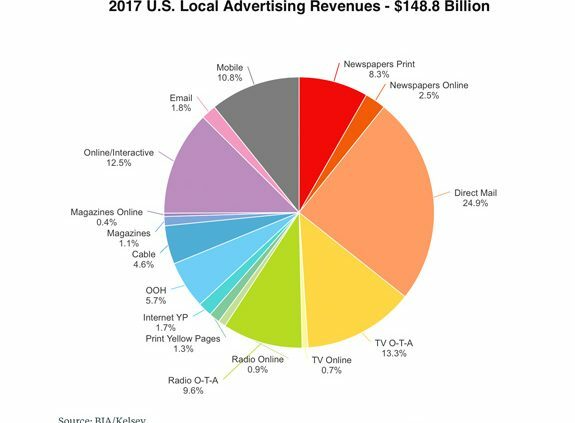 The article appeared in AdAge.com and the headline read “Digital Ads to Overtake Traditional Ads in U.S. Local Markets by 2018”. Wow! The article was accompanied by the colorful graphic included here from BIA/Kelsey. But… the article’s copy started backpedaling from the headline almost immediately as it redirected the broad category of “Traditional Ads” to just “print”. I went from “Wow” to “Gotcha”. It took reading the whole article to actually understand to what was being reported. And I kept going back to that beautiful pie chart and thinking “Where’s Google in all this?” So unless you really read into it, the article leaves the reader with just enough information to be dangerous. Doesn’t make a very good headline though, does it?